A Famous French Satirical Puppet Show Might Be Coming to the U.S.No strings attached. Ed Sheeran Isn’t Any ‘Happier’ As a Puppet in His New Music VideoOh no, he even has little puppet tattoo sleeves! Melissa McCarthy to Investigate Puppet Homicides in The Happytime MurdersThink Who Framed Roger Rabbit? with puppet cadavers. Watch Chance the Rapper Sing With Puppets in the ‘Same Drugs’ VideoAs seen on his Magnificent Coloring World Tour. The Story Behind Jason Segel’s Dracula Puppet MusicalIt was a weed-powered attempt at stardom long before Forgetting Sarah Marshall. Neil Patrick Harris’s New Web SeriesOh, hi, Joe Manganiello! Watch Hands of God, a Documentary About Christian PuppeteersSinners come in all shapes and sizes, including felt! See Requiem for a Dream Re-created With PuppetsEllen Burstyn looks … weird. 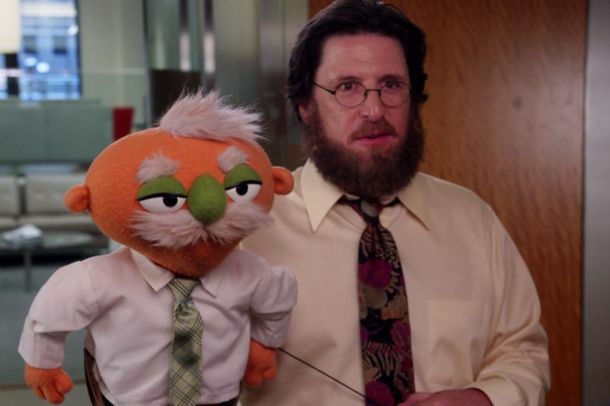 NBC Making a Puppet Sitcom With the Jim Henson CompanyMuppet fever! Watch a Large, Drunk Puppet Stumble Around IrelandHis name is Arthur. Watch a Bizarre Halftime Show Starring Village People PuppetsBizarre, but actually somewhat impressive? Cameron Diaz Offered a Role in Dark Puppet Movie The Happytime MurdersWe’ve read the script, and it would make Fozzie blush. Homeless Kermit Puppeteer Not Actually HomelessBut don’t feel [too] duped! Watch the Dancing Reggaeton Puppet Hump the SidewalkOh, you didn’t know about the dancing reggaeton puppet? Watch Pharrell and a Yellow Puppet in a Cute Short Film Called Where’s the Money, George?Odd but so adorable. Rosie O’Donnell and Craig Ferguson Are ‘Addicted to Love’It’s just Craig being Craig. Exclusive: We’ve Seen Steve Carell’s ‘Beaver’ ScreenplayOur verdict? This is one of the more elegantly messed-up stories we’ve read in a long, long time.